a.Title of your page: Enter a clear title for your myPage. (Try to use a simple title which incorporates the cause for which the funds raised. b.Reason for raising the funds: Enter the occasion /reason for raising the fund. (Don’t worry if you don’t have an occasion, after all you don’t need a reason to raise funds for the less privileged but the desire to reach out. As you know my <occasion>is as usual falling on <date> which is <> weeks from now. This year I want to celebrate this special occasion by donating Rs < > to <Name of the Cause e.g. provide education, shelter, medical care etc. to the vulnerable street girl children>. I am planning to raise <Rs. > . This money will be used by <Name of the NGO> to provide shelter and care to street children especially girls. I’m contributing towards the cause because I feel that I have a responsibility to care for others, to help those less fortunate than ourselves. The details of the cause are given below. d.Start collecting money from: Enter the date from you are planning to start collecting contributions. e.End Collection money : Enter the date on which you want the contributions to stop. Search causes and add it to myPage : Click to add causes to myPage. The link will take you to list of causes. You can add as many numbers of causes you wish to. 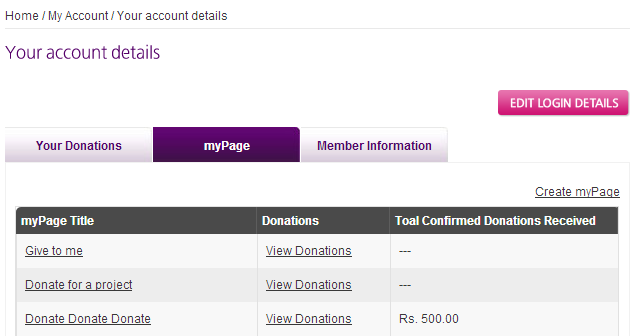 Receive Donations and Track Results : You can track the result of myPage appeal for donations. Please click the My Account link on the top right corner to view your account.